The idea that people are taking sides on this sounds an awful lot like the way genre fiction is judged by some to be less worthy than literary fiction. Both are fiction. Just because they tell different types of stories doesn’t take away from the fact that they’re all stories. Each has its own merit. I am certainly no art critic or collector, but when you posted about the mask in the previous entry, my first reaction was this: it’s beautiful. Clearly you think so, too. Shouldn’t that be what matters most? 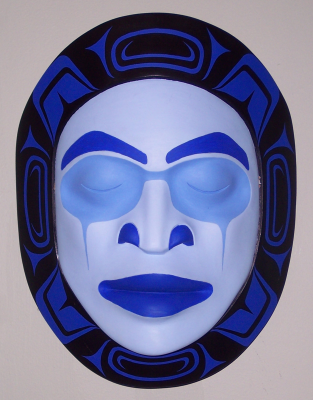 In all fairness, I should stress that some of those who disparage the mask are real experts, with more knowledge of the cultural and technical aspects of Northwest Coast Art than you or I will ever have. In a lot of things, their opinion is worth more than ours because they are experts. Nor are they against the art developing; in fact, at least one of them repeatedly says that the art needs to develop. I suspect that their concern is that the mask is too much of a departure. Obviously, I disagree with them here. But I don’t do so because I claim to know more about the culture or the technical skill required to produce the mask. I do so because I think that the different opinions are a matter of aesthetics and personal taste — in other words, about something that is subjective and can’t be quantified. I actually have an enormous respect for some of those who disparaged the mask. Yet, at the same time, I have a strong aesthetic reaction that differs from theirs, and want to explain and justify it. Well, just because someone is a great artist doesn’t necessarily make them an exemplary human being. At some points in his life, Bill Reid expressed what I consider mean-spirited ideas, such as saying that Haida art was superior to all other art forms on the coast, and that the northern style to which the Haida tradition belongs was the only one worth considerng (or words to that effect). By contrast, though, the couple of exchanges I’ve had with Vickers do suggest that he tries hard to act decently, although I can’t really claim to know him. I have been trying to track down Mitch Adams on facebook for a bit of time now, I was hoping you could help me out with a link? Maybe a few links to info on his art I may have missed? It would be greatly appreciated. There’s only one Mitch Adams on Facebook, and he’s the one you want. Check the photos if you want to be absolutely sure.